Keith Green Construction installs the Guardian Series Vinyl Deck Membrane by DecTec™, offering tough, durable deck protection for your outdoor patios, decks & living spaces. 60-mil thick deck membrane withstands 5000 hours of UV weathering tests. Comprised of a reinforced PVC decking membrane, providing waterproofing and UV protection. DecTec™ systems are adhered directly onto wood or concrete, sealing the surface from weather damage. 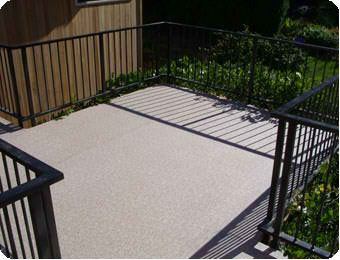 DecTec’s™ slip-resistant component makes decks safe for children and the elderly. Long-lasting, requiring only the simplest of cleaning for maintenance. UV-stabilized to prevent fading, as well as anti-microbial to fight off mold and mildew.